YOU WILL RECEIVE EXACTLY WHAT IS PICTURED/PHOTOGRAPHED. TIP: MOUSE OVER THE PHOTO TO VIEW A POP-UP OF AN ENLARGED VERSION OF THE PHOTO TO SEE ALL THE DETAILS! Enjoy this Vtg Dandee Dan Dee Bird Parrot Toucan Pink Yellow Nylon Puffalump Style Plush. 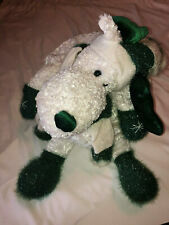 VTG Puffalump Bells Dan Dee White Green Holiday Moose Plush Stuffed Animal 16"
Plush Stuffed Animal. White Green. YOU WILL RECEIVE EXACTLY WHAT IS PICTURED/PHOTOGRAPHED. EXCELLENT USED CONDITION. HAIR TUFT IS FRIZZY/MATTED BUT OTHERWISE LOOKS GREAT. Vintage Dan Dee International Puffalump Plush Bear Stuffed Animal Pink 14"
Up for your consideration is a Dan Dee International 14" (seated) puffalump bear in very good pre-owned condition. I'm a Dan Dee Vintage Purple Bunny Rabbit Puffalump Style Plush 11"
This is a Dan Dee Purple rabbit plush. This great Dan Dee bear has nylon shell in puffalump style.